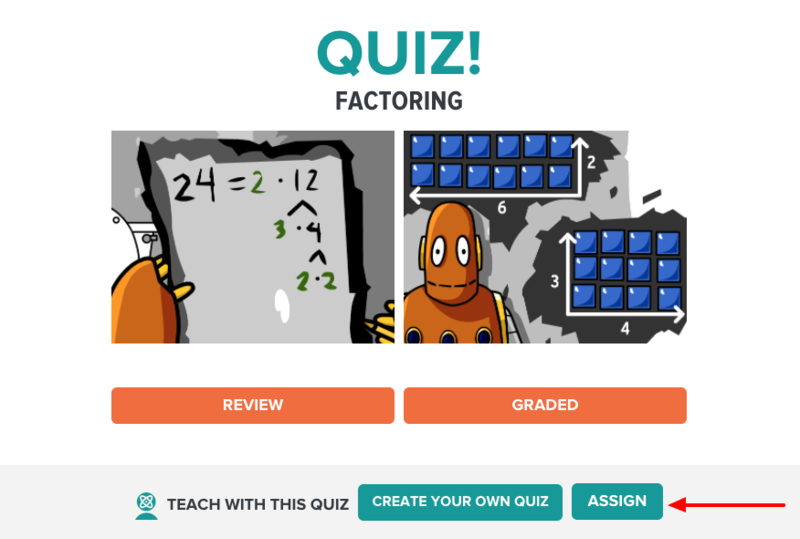 My BrainPOP educators can assign specific features or build an assignment for students to complete. To create an assignment, first log into your My BrainPOP educator account. Then, click Assign below the feature you want to assign. 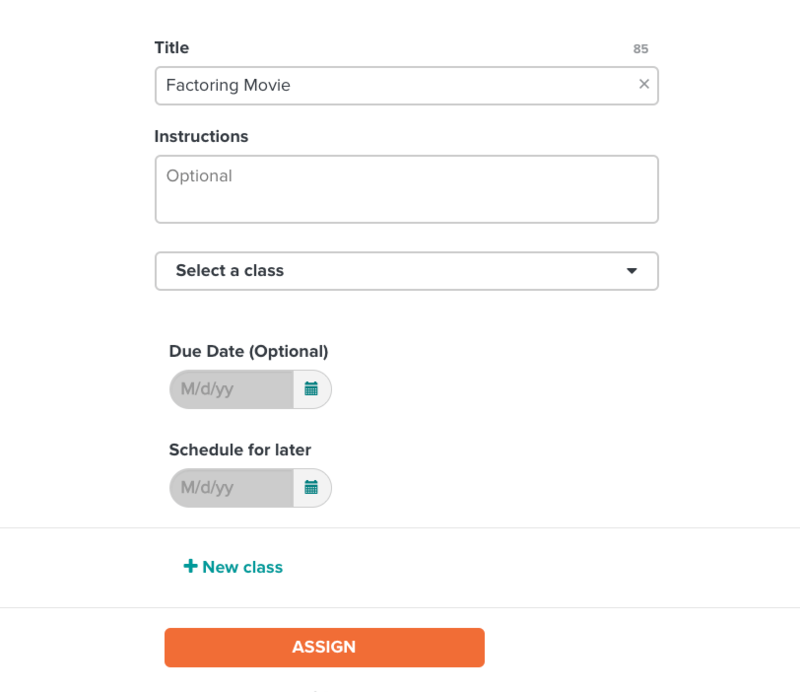 You can add instructions, select which class to assign to, add a due date, or schedule the assignment for later. 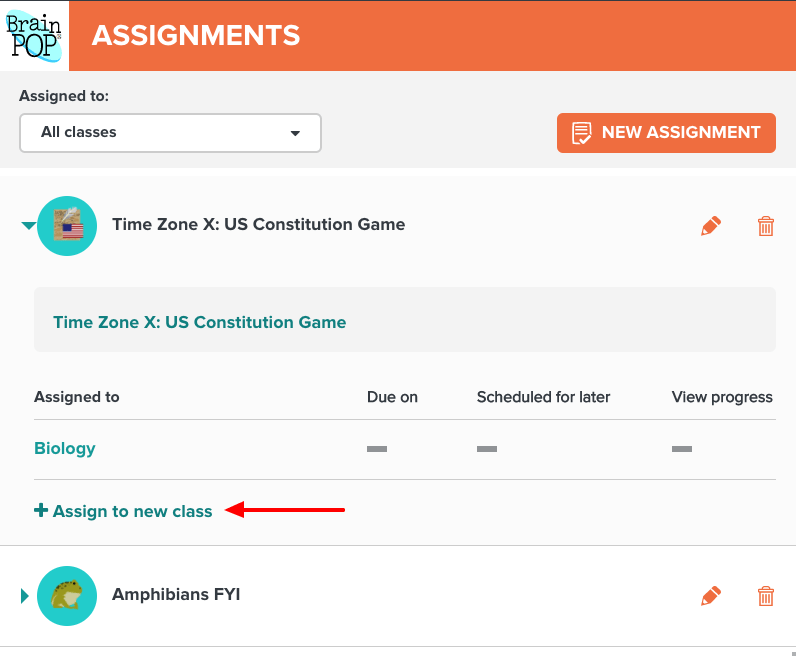 You also have the option to assign the feature to the whole class or to specific students. 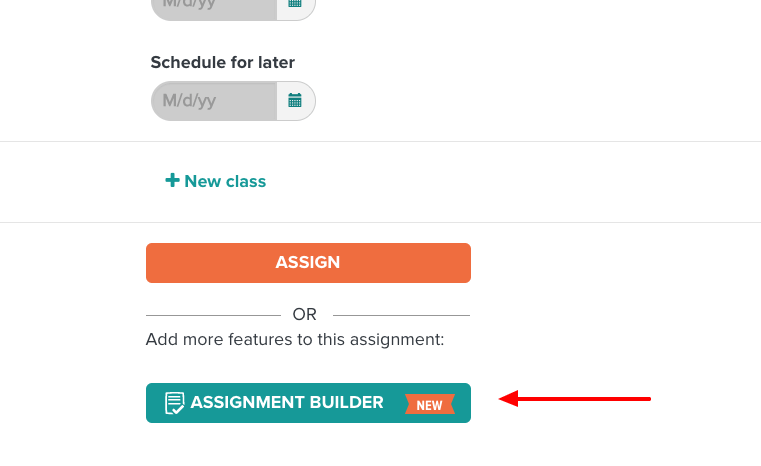 You can use the Assignment Builder to create one assignment with multiple parts. You can even mix and match features from different topics in one assignment. Log into your My BrainPOP educator account. Click Assign below a feature you want to assign. Then, click Assignment Builder. Select the features to include in the assignment. Click Add Topic to include features from other topics. When you are finished adding features, click Save. Or, click Next to edit your assignment. You can edit your assignment by changing its title, adding instructions, and re-ordering the features. To change the order of features in the assignment, click and hold the three lines icon next to the feature and move it to where you want it in the sequence. After editing, click Assign to send the assignment to your students. You can assign to one class, multiple classes, or specific students in your classes. Due dates and start dates are optional. Can I assign one assignment to multiple classes? Yes. Click Assignments at the top of the screen. Then, click the dropdown arrow to the left of the assignment and click + Assign to New Class. Select the classes you would like to add. Can I include features from BrainPOP and BrainPOP Jr. in a single assignment? 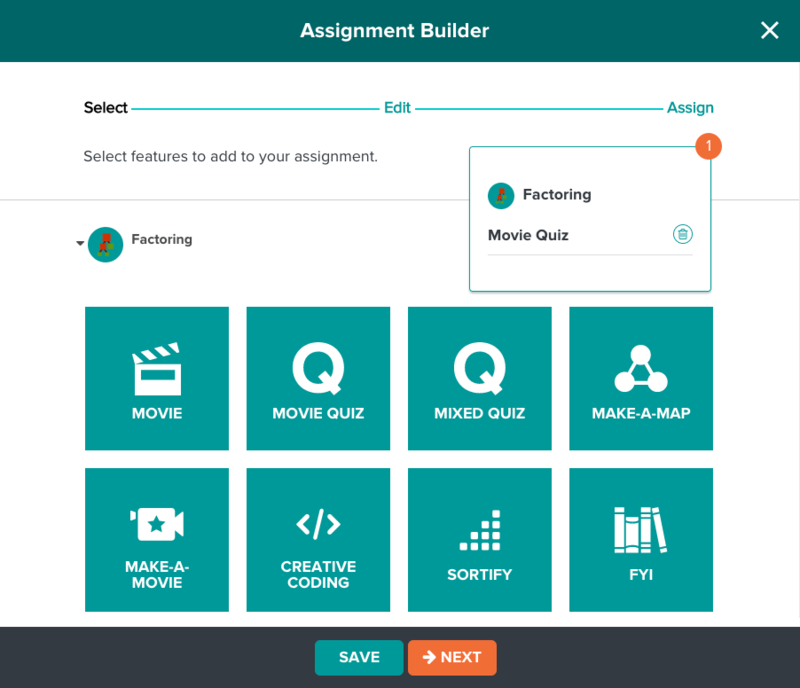 If your school has a subscription that includes BrainPOP and BrainPOP Jr., you can add BrainPOP Jr. topics and features to a BrainPOP assignment and vice versa using the Assignment Builder. You can also add any GameUp title(s) to an assignment (for BrainPOP and/or BrainPOP Jr.). Can I save an assignment as a draft and assign it later? 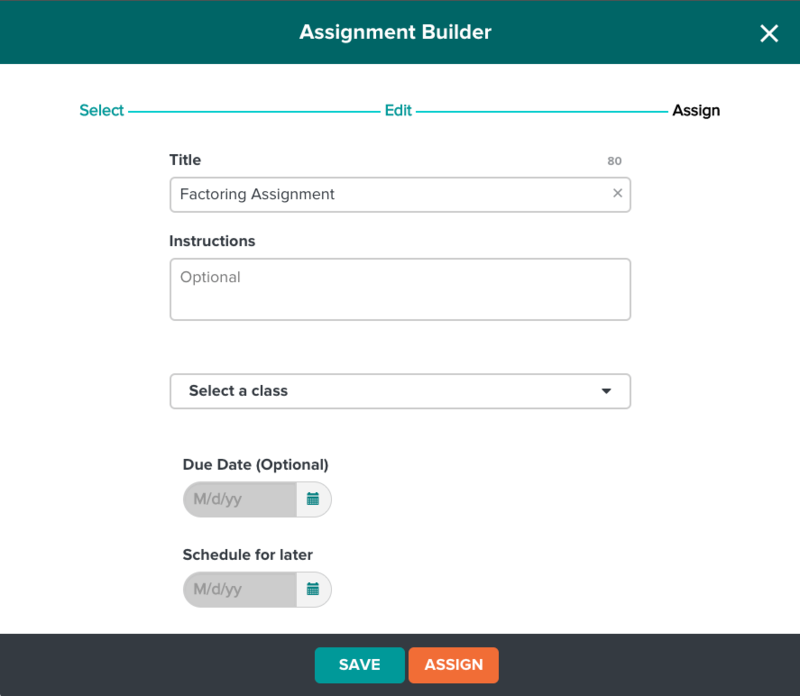 Assignment Builder allows you to save your assignment at any point by clicking Save at the bottom of the screen. The draft will appear with your other assignments. Can I assign features that don’t include submittable work, such as a movie, Related Reading, or game without SnapThought? Yes. When a student watches a movie, reads a Related Reading, or plays a game without SnapThought, the task will display as “Completed” in your class timeline. This does not include "Practice" or "Flash Words" for BrainPOP ELL. Can I write a prompt for a feature? 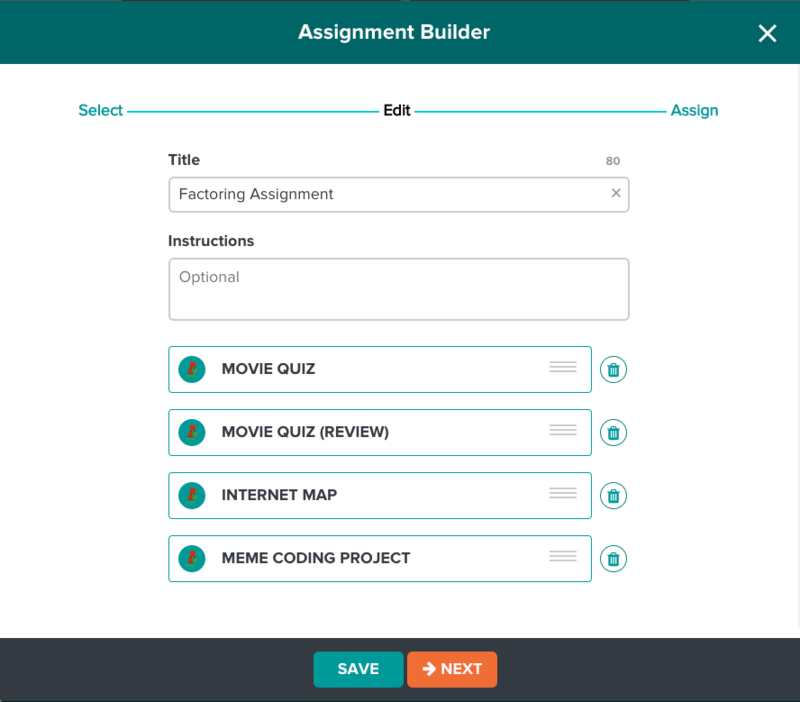 Assignment Builder provides a field for instructions. Can I assign features in BrainPOP ELL? You can! As of Oct. 21st 2018 you can assign ELL work to your students. Placement tests can be quick assigned but cannot be assigned using the assignment builder.